On Friday, I decided to muddle around the shopping event before I got ready for the Indie Show. I was so comfortable in this dress gifted to me from Rachel Pally. After the previous day of being dressed to the nines all day long, it was so nice to still have a put together look, but still be comfortable. The plus size designer of the year was Rue114. I had seen this line a few months before and was already familiar with this season's look. I must say that I don't think the photos translated as well as the looks did on the runway. On the runway, I guess you can say "I got it." It was the like the Congo meets Betsey Johnson. It was totally fabulous, colorful, and out of the box from what I have seen previously from this designer. Rue114 definitely slayed the show and let you know why she was voted Designer of the Year. Event Note: Lawwwwdd Ha'mercy (in my most countrified voice) From the Rez to the City spilled all the beans about FFFWeek. I was thinking about talking about this on this post, but I feel like I'm always the bad guy. Go and check out her very honest and true critiques of the event. You can find it here. This was my 3rd time attending and these issues seem to get worse every year. (1st year I was apart of the fashion front, 2nd year I worked as a stylist, 3rd year I went as just a guest). I always get asked the question, Do you think I should attend FFFWeek? I always say that you should go at least once and then make the decision from there, because my experience might not be yours. For someone like me who is a full time blogger, it's like a chance to get to talk to other bloggers (the majority of which are like sorority sisters), network with companies, and work. So if nothing else it affords those opportunities. A lot of the things I do take place outside of the event, itself. As far as the fashion goes...ehhh. An then you have your Insta-celebrities. (Insta-Celebrity - One who has a great sense of importance and faux fame from the fact that they have a substantial following on Instagram) who throw more shade than a California Sequoia. Again read Rez' blog for more info on those knuckleheads. Brava Rez! I love that dress. It looks great on you! I can't wait to read Kiah's post. I've heard/read a lot about the events at FFFW. You looked so cute in that dress! Love it! II went over to Kiah's blog and read her review. I was shocked about the fashion disappointment, but not about the clique-ish behavior. You see it online!! It's ok though. You guys are super sweet and you always inspire me. Looove that Rachel Pally dress! I'm so bummed I didn't get to see you at FFFWeek! 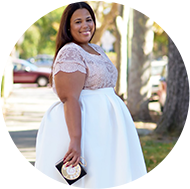 You're one of the first plus size bloggers I started following that are truly inspirational and real. This was my first time attending FFFWeek and I definitely saw the cliques. It's a shame, but I didn't let them spoil my time. Kiah's recap DEFINITELY made me think twice about whether or not next year's going to happen for me and FFF. It's just so hard to believe that we all know everyone on the curvy side of things has experienced shade from the "norm" and some still have the nerve to throw shade on others? Oh well! I'll just stick with following my core group. You guys inspire us even when you don't even try (I for one am going to make more of an effort to update my blog a bit...you never know who will be inspired/can inspire). p.s. Can't say it enough...you and Kiah are just as beautiful in person!